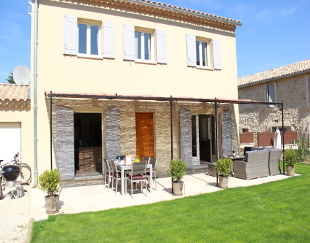 ﻿ Accommodation at the Villa in Taillades, during your stay with Provence Cycling Holidays, self guided bike tour in the Luberon, Provence, France. 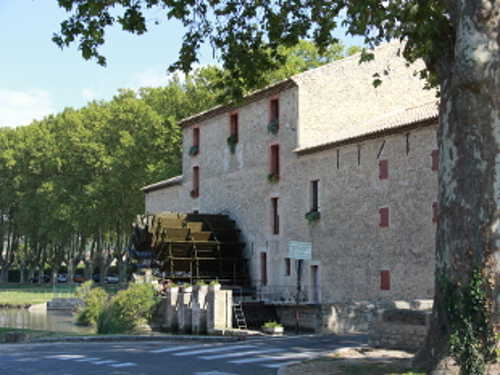 Our villa, is a new building from 2016, that is set in and alongside a beautifully renovated development, opposite the landmark huge water wheel and mill of Moulin de St Pierre. 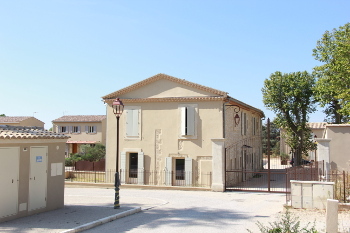 The villa is situated in the village of Taillades, in the beautiful Luberon National Park, just 7kms from our B&B location in Coustellet (an easy and pleasant ride along the superbly converted rail track). We hope your stay will be a comfortable one in the villa, which has been furnished, decorated and equipped to a high standard throughout. There is plenty of space on the open plan ground floor, with a luxurious dining area with all that you would need for a special meal. Close by is the sitting area with 2 comfortable sofas and an arm chair, a coffee table and large TV (UK & French freeview channels). 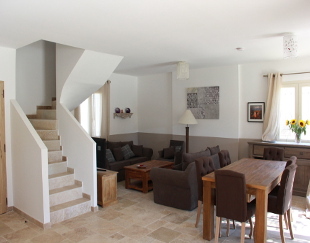 The ground floor has beautiful travertin stone flooring throughout. 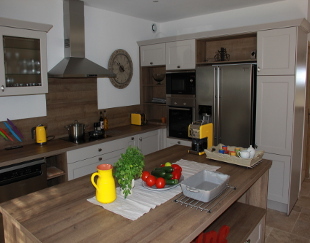 An attractive, spacious kitchen has everything you would need to prepare some memorable meals with family and friends; with an oven, induction hob, american fridge, microwave, dish washer, all the pots and pans, coffee machine, etc... Nearby is the utility room (with washing machine, hoover, iron & board etc) and a downstairs WC. The house has free WiFi available throughout and on the terrace. And to keep you comfortable we have air conditioning on the ground floor, and shutters on all the windows up stairs to keep the heat out. Enjoy the great weather outside on the large stone terrace under the shady cover of the pergola, with on one side the outside dining area, and on the other there's room to relax and have drink on the patio furniture (sofas and table). There is also a large Weber charcoal BBQ available so you can make the most of the good weather. 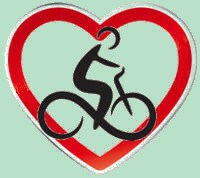 We are also within easy driving distance of the Tour de France's "Giant of Provence" classic mountain climb Mont Ventoux (starting at Bedoin), the beautiful towns of Aix en Provence, St Remy de Provence and Arles, Les Baux de Provence, Glanum Roman village, the Pont du Gard aqueduct, the Fort de Buoux, to name but a few... should you fancy an afternoon off the bike. The villa has 3 bedrooms, 2 rooms have nice large queen sized double beds, and one has two single beds, which can be easily moved together to form a large double, if necessary. All of the rooms have been decorated in an attractive Provencal style, and furnished to a high level. Furnishing and equipment for all rooms include: travertin stone floors, quality beds and linens, bedside tables and lamps, a wooden chest of drawers, a wooden wardrobe, an armchair and a flat screen TV with UK and French freeview channels. 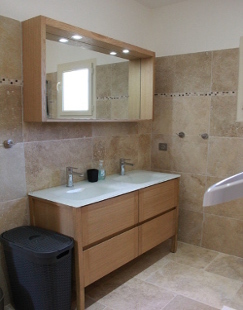 The villa has two luxurious stone-clad bathrooms: one ensuite and one shared over two rooms. Both have large walk in showers, large wash basins, towel heaters, a WC and a hair dryer. Two sets of towels are provided per guest. In terms of toiletries, we supply: handsoap, shampoo & shower gel. The Mill: Queen size double bed with ensuite bathroom. Taillades: Queen size double bed with large shared bathroom. 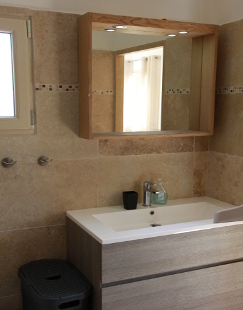 Cavaillon: 2 single beds (can be pushed together to make a large double) with large shared bathroom. Five of us had a fabulous time with Neil and Nat. We stayed in their Villa, you do have the choice of the B&B but we were so happy with the Villa. A 3 bedroom villa, fully stocked kitchen and a pool to cool off in. A place to visit and accommodations I would give five stars plus two!! Rose - Canada - Sept 17 Villa-based Tour Review. We opted for the Villa offering and were not disappointed, it was beautifully presented and catered for our needs. Robert - NZ - Sept 17 Villa-based Tour Review. The open plan kitchen, diner and lounge were perfect for our needs and was the perfect place to relax following a day cycling. The kitchen had modern appliances throughout with all the utensils that we needed and an all important laundry room for that sweaty cycling kit. The lounge had a TV with english channels as did all the bedrooms.